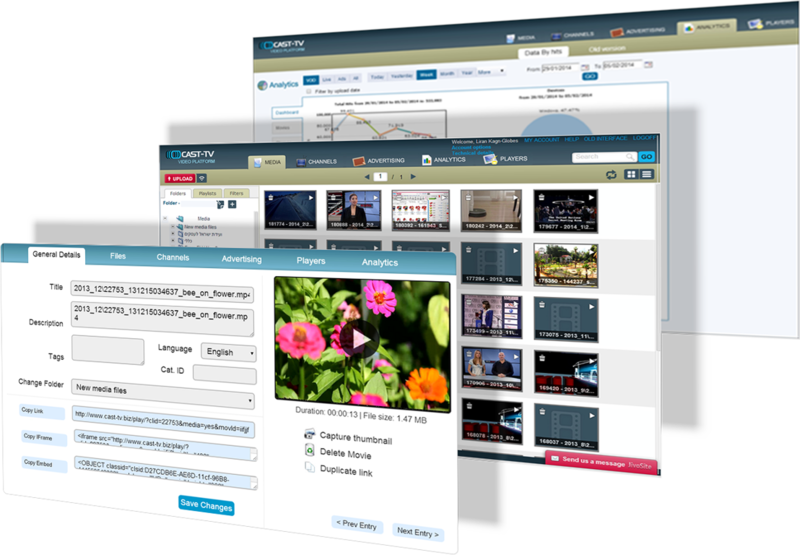 Cast-TV will setup the live and VoD user-friendly CMS interface that manages the layers of our solution. The CMS is where content attributes and policies will be defined by content managers and communicated to the policy enforcement system component. Cast-TV will get ingest VOD content in bulk and manage ingestion pipelines, content monetization and control tools. We will manage transcoding centrally, matching different screen resolutions, in order to deliver flawless streaming across all devices. Cast-TV will assign a dynamic catalog for linear channels for its Electronic Program Guide (EPG) data, created from its media assets. Cast-TV TV-Dash is the main service platform that manages the entire workflow of our OTT video solution, including enforcement functions, applications and content rules policies. TV-Dash or HTTP is the core of our solution and the hub to clients. It is designed to easily scale and serve millions of viewers. Managing content and media workflows Video On Demand (VOD), Live broadcast channels (Linear), Catch-up TV Play list, Social TV, and other Online content. Cast-TV CMS includes Player customization for the customer’s Needs: providing a branded and unique player design. Cast-TV Player is integrated with Social Networks; Facebook, Twitter and LinkedIn.